Right in the center of the city whose infamous wall a certain '80s beefcake claims to have helped tear down, there’s a small, hidden museum in his honor. It might have started off as just a joke and a shrine, but Berlin’s David Hasselhoff Museum celebrated its one-year anniversary this month, complete with plenty of revelers who came to watch video montages of the American actor and singer who inexplicably became a German cultural icon. It’s not in many travel guides and is on even fewer official maps, but the Hoff museum is hidden away in the basement of the trendy Circus Hostel in Berlin’s Mitte neighborhood. According to the staff, it’s most often found when visitors at the upstairs café or basement bar stumble upon it on their way to the restroom. "People often come into the bar giggling after having discovered it," bartender and museum curator Ally Chaplin tells mental_floss. "We also have a few Hoff masks left over from one of our parties displayed in the bar, which encourages people to ask about him, and then we can send them to look at the museum if they haven't already found it." Originally devised as a gimmicky shrine around eight years ago, the bar’s patrons embraced the dark, framed portrait of the actor and would occasionally graffiti their love for him around the bar. When the hostel renovated in 2014 and installed its own microbrewery in the spot the shrine had stood, one of the hostel’s co-owners suggested expanding their Hoff lore with a museum in an unused hallway on the opposite side of the basement. Chaplin took on the project, spending months scouring eBay and Amazon for memorabilia. "The Knight Rider car was the hardest item to secure," she says. "They come up periodically on eBay auctions, but they get quite expensive." Chaplin—who wore a "Don’t Hassel the Hoff" tee to the museum’s anniversary party—says she planned out the space in four loose categories: one celebrating Hasselhoff’s influence in Berlin, sections on both of his successful television shows (Knight Rider and Baywatch), and then one promoting their campaign to change the name of the street outside the hostel, Weinbergsweg, to David-Hasselhoff-Strasse (strasse is the German word for street). 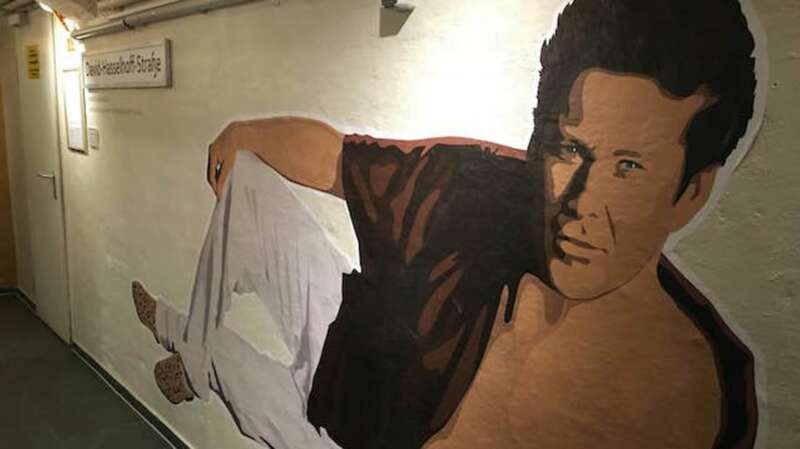 As for the original art the museum boasts, Chaplin says that, based on her Google searches, the oversized, reclining Hoff that greets visitors is the largest Hasselhoff stencil in the world. (If true, it would be just another world record the Hoff holds claim to: He once held the Guinness World Record for most-watched man in television history—which Hugh Laurie overtook in 2011—and also holds the record for the highest reverse bungee jump.) When the mural first debuted, Chaplin had included some fake chest hair on her design. Visitors would jokingly stroke the chest hair to pay tribute to Hasselhoff, but the staff soon had to remove the fuzz. "It got really oily and gross very quickly," bartender/barista Manuela Hristova says. "People just couldn't resist touching it!" And though Hasselhoff's icon status in Germany isn't nearly as profound as foreigners often tend to think—"German tourists realize faster that it's a joke more or less and the others still try to find a reason why the Hoff is our hero," Hristova says—the actor did manage to have a bit of slang named for him in the past decade. In 2007, a video of him lying shirtless on the floor, drunkenly trying to eat a cheeseburger, went viral. The resulting German phrase, gehasselhofft, roughly translates as "to be extremely drunk, as Hasselhoff." It's fitting, then, that patrons can knock back a few while discovering the museum and recalling their favorite Hoff moments. "It's happened a couple of times that guests would know much more about him than we do, or that they would have a friend who's very obsessed with him or have seen him live," Hristova says. "Normally people are curious if there's a reason why we chose David Hasselhoff, but it is just for fun, really."